The arm has a nice dial tilt mechanism and the board has a level to show the proper angles for the keyboard. Two gripes are that the board does not swivel well, and lowering the platform is not that easy without losing your mouse and keyboard. Adjustable in height, depth, tilt, and angle. The mechanism allows adjustment of the tray to an average range of heights. To achieve lower heights, shims can be placed between the desk and the track. The mouse area is located on either the right or the left of the keyboard on a swivel rectangular tray. The wrist rests can be removed with a screwdriver. Mouse cord clip is nice so the mouse stays on the tray. A level shows the user how to position the board properly. The keyboard tray is nice because it focuses on instruction on proper keyboard placement; however, the adjustments are poorly designed. The tilt is the only adjustment easy to use. The height and rotate functions of the mechanical arm are very difficult to use. The knee clearance is sufficient, but there could be more with a better designed attachment plate. Grease is one big negative in the tray. 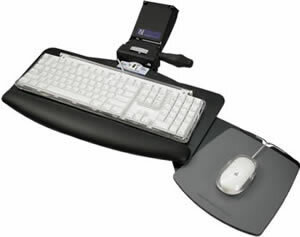 If the keyboard tray is not cleaned when installed, it is possible to get it on your clothes when scooting under the desk with legs near the track. The platform is designed to fit all keyboards, and the removal of the keyboard platform wrist rest will allow for the split keyboards to fit. The mouse surface is ok, and a nice addition of the wire clip makes sure the mouse doesn’t roll off the back of the platform when storing. The mouse platform can be mounted on either side with a hex wrench. Overall, not the best in the world for functionality, but the instructions are nice. P.O. Box 2372 – 300B S. Elliott Rd.